If you order our service, we'll develop an Android mobile app to promote your affiliate offers or to generate revenue from an ad network such as admob or revmob. The app will have content that is relevant to your offers or niche and we'll place your ads, admob, revmob or whatever you like to monetize it (ask us first if the app will fit any special or non traditional way of monetization from your CPA network). 10 articles, relevant to your niche. You can send your own content if you like. Unlike websites, mobile apps generate income faster, some within days of publishing with proper promotion and listing optimization. Be sure to check out our extras to jumpstart your success with your new app. Push notifications can be included if you order the extras and if you need the iOS (iphone/ipad) version, it can be ordered as well. This will be your first step towards having your own mobile app empire. 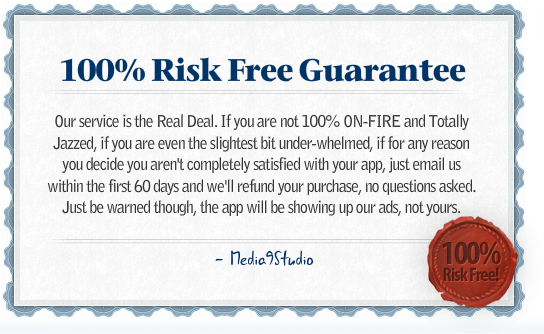 Our apps are high quality and they'll never look spammy. We can take custom orders or if you need an app for your offline business we can take care of that too, so feel free to ask. Your satisfaction is guaranteed. Order with confidence. A percentage of all our revenue goes to fund cancer research. 100% money back guarantee, no questions asked. You keep the app, but it'll show our ads and offers, not yours.